The following liner notes are copyright 2007 Arundo Recordings. For more information or purchase of this recording visit CD Baby and Amazon. After twenty years of performing together, the Bassoon Brothers and their sole sister have again ESCAPED the boundaries of “classical music” which confines and defines most bassoonists. We’ve CAPTURED1 some other styles of music here and in our two previous recordings, and have heard from our fans that you have WANTED1 more from us. With this recording we pay our respects to the musical venues of country, bluegrass, swing, pop, funky jazz and rock surfer music as well as a dose of music from the Renaissance, baroque and classical periods, and comic operetta. 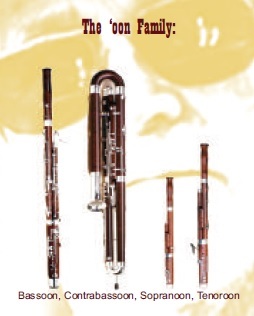 As bassoonists, we are a rare breed and are sorely out numbered by other wind instrument families. Our endangered instruments come from a family of long forgotten fagotten. Only the bassoon and contrabassoon of the wonderful double reed family we call the ‘oons have ESCAPED oblivion over the last 400 or 500 years and are still productive today. Other early double reed instruments, the rackett (aka sausage bassoon) and crumhorn, for instance, didn’t make it. Through the acknowledgment of the bassoon’s versatility and wide range we do still exist and occasionally get some respect. More composers are taking notice. Bassooner or later we’ll get everyone’s attention, and hopefully also get the public to quit calling our magnificent instrument an oboe. At the cusp of the baroque period of music the bassoon evolved from the double bore Renaissance instruments called curtals or dulcians, which were carved out of a single piece of wood. The bassoon came about as a practical matter for ease of transport and manufacture. The predecessors were cut into a bundle of sticks or fagots; the German word for bassoon is das Fagott. Some younger bassoonists have taken umbrage at the name-calling, however, Professor Peter Schickele (Lip My Reeds) believes that players should be called stickests, since we are playing on a bundle of sticks. Historically we’ve noted a problem that has limited our numbers. Our instruments cost at least three times as much as other woodwind instruments. Church records dating back several hundred years show that the cost of these instruments for the church orchestra discouraged purchase of more than one or two. Our family of instruments is expensive, and not easy to build and maintain. Add to that our strange, delicate and fickle double reeds, which confound every player and limit the numbers of happy bassoonists. As instrumental ensemble music was developing well before symphony orchestras, similar instruments often played in groups called consorts (recorder consort, consort of viols, etc.). Here a bassoon band would have employed the sopranoon, altoon, tenoroon, bassoon and contrabassoon. Perhaps there was an even tinier sopraninoon and a baryoon too back in those days. We’re on a mission to resurrect the known extinct family members and bring them back to life. You will hear some of the smaller ‘oons in solo parts on this recording. We hope that this exposure will encourage their resurrection worldwide putting these smaller instruments into the hands of younger players. In Europe the smaller ‘oons are called fagottinos and can be found in tiger stripe yellow to appeal to children. Twenties and Forties Set opens with the familiar Song of the Volga Boatman utilizing the original 1941 Glenn Miller dance band arrangement in the form of a bassoon big band. Contra and bassoon play the bass line, four bassoons on the trombone line. The trumpets line is a combination of tenoroon, sopranoon and soprano saxes. A full sax section and rhythm section rounds out the band. Jazz solos on the high bassoon. The perking twenties tune, You’re the Cream in My Coffee completes this set. Gilbert & Sullivan Set lets you hear the various ‘oons in solo combination. Here you’ll hear some spontaneous embellishment that’s just like our live performances. The first is four bassoons taking turns sharing the lead in the The Town of Titipu (the Mikado theme and tune The More Humane Mikado with its lyric “Let the Punishment Fit the Crime”. Next is a sopranoon lead and cadenza from HMS Pinafore’s I’m Called Little Buttercup (after regaining control from a greedy perpetrator). Two tunes from The Pirates of Penzance feature the tenoroon on When the Felon’s Not Engaged in His Employment, and the contrabassoon on I Am the Model of a Modern Major General. PDQ Bach Set stands alone with Lip My Reeds, a prelude and fugue for four bassoons written by fellow bassoonist and mentor Peter Schickele. We have recorded his other bassoon quartet works on our previous CDs. At the end of the Lip’s prelude there’s an added low note which is produced by placing a toilet paper tube over the end of the bassoon’s bell. With the surprising loud punctuation, the tube and toilet paper goes flying off. The trumpeting reed chorus is a Schickele trademark, and the high Fs in the piece challenge the extreme range of the instrument and player. Dance Set starts with a Renaissance tune, the joyous La Morisque, an example of how a double reed consort might have sounded 500 years ago. The various tone colors and ranges of these instruments are heard in solo juxtapositions. Can you identify the combinations? All the ‘oons are playing at once in the tuttis. Minuet and Dance is what we call an “aha” medley. You’ve heard these tunes on TV, but you can’t name their composers or titles can you? There’s a minuet from a Bocherini string quartet, and from the Dance of the Hours by Ponchielli is a tune some may think of Alan Sherman’s Hello Muddah, Hello Faddah. We’ve thrown fragments of a familiar old rag into the mix just to confuse things further. This set ends with funky jazz piece originally written for solo bassoon in a new BBs arrangement of Ode to a Toad penned by the Godfather of jazz bassoon Ray Pizzi. The Northern Europe Set begins with Grieg’s dark and brooding music from Peer Gynt that could have originally have been written for bassoons (we think that’s the case with many composers). Anitra’s Dance with its pizzicato moments leads to Solvejg’s Song in a call and response between the distant bassoon and contra. The Finnish Folk Song is a gift from the Oregon Symphony’s resident Finn and violist Peggy Swafford from her string arrangement taking dark and brooding further yet with seven bassoons and contra. Completing this set contains another of the two pieces actually written for bassoon quartet on this recording. Or was it really? The Bassoon Brothers think that Prokofiev’s Humorous Scherzo was probably a failed piano composition that was later transformed into a bassoon quartet after the illumination resulting from a night of serious inebriation. The Bassoon Brothers are surely the first to identify this revelation. This was recorded with guest bassoonists in rehearsal leading to concerts at Chamber Music Northwest featuring Prokofiev’s complete chamber music. Country and Bluegrass Set begins with a Johnny Cash Tribute with his hits Ring of Fire, I Walk the Line and Folsom Prison Blues to honor the late country vocal basso whose range he shared with the bassoon’s low register. A Johnny favorite, Orange Blossom Special gets a bluegrass treatment. The train leaves the station led by Oregon Symphony violinist Gregory Ewer and the bassoons really have trouble keeping up the pace before the wheels come off the track. Bach Set features J. S. Bach’s ubiquitous and most recorded (aha) piece by disparate instrumental combinations in the Air on the Bassoon Reed (okay, Air on the G String). So we had to join the fray. Completing the set is a nice fast drive for bassoon quartet called The Italian Job, taken from one of Bach’s noteworthy harpsichord pieces that scoots around likely we’re all driving Mini Coopers. Surfer Set features two pop tunes that we’ve heard many times over the last four decades. For a gig in a church we thought we should play a hymn, but came up with a “her” instead with the Beach Boy’s Surfer Girl. Misirlou’s origin is Middle Eastern but we take the surfer approach to this one featuring electric wah-wah bassoon and Ewer’s fiddling. You may remember this aha from Pulp Fiction and TV commercials. You too could be a rock bassoonist with a bocal pickup and guitar amp. P.S. There are no guitars playing on this track. In Memoriam is from the Larghetto e spiritoso second movement from Vivaldi’s Concerto for Two Violins in A minor. Vivaldi, wrote 37 concertos for bassoon (more than any other instrument except the violin). So he could have been thinking of this piece originally for bassoons. Depending on the tempo, this piece can feel happy or sad. We’ve performed it for several funeral services and with this final selection honor the memory of those close to us who have passed on in recent years. We remember that Bassoon Brothers’s biggest fan, Elaine Naglee, who always had her camera in hand, had a goal of hearing Hells Angels3 (played by the Bros) which she lived to see and hear. We also dedicate this recording to the memory of Juanita DeGomar, Irvin and Peg Mann, and James Eubanks who always loved Johnny Cash and to our Oregon Symphony colleague Martha Herby who was a regular at Bassoon Brothers concerts. The music on this recording is arranged into sets of similar or related material. But try hitting the random play button for a different flow and surprises. We hope you’ve enjoyed the journey and Escaped with us. Mark Eubanks sopranoon, tenoroon, bassoon, bassoon reed, saxophones (soprano, alto, tenor, baritone), percussion, synthesizer, midi tracks, sound effects. This recording acknowledges the BBs 20th anniversary performing together in Portland, Oregon where we have been full time Oregon Symphony musicians. We thank the Symphony for their support and recognition that bassoonists can be cultural ambassadors, especially where a prissy string quartet just won’t do. We laud the work of the Guntrum Wolf in Kronac, Germany who is building replicas of the early ‘oon instruments heard here. We encourage a growing number of smaller ‘oon enthusiasts in Germany and England who are getting the “fagottinos” into their music programs and bassoon enthusiasts and family bands with players as young as eight years old playing the tenoroon. We hope others will follow and that modernization of these instruments will occur. Thanks to our studio tonmeisters Lyle Dockendorff and Karen Wagner and her mother for their assistance and John Lemon for his bassoon compatible Walter Midi studio acoustics, his midi synthesizer assistance and one shaky hand. One more thank you to Lyle for his help with these arrangements, particularly You’re the Cream…We send love to our jazz bassoon mentor Ray Pizzi, for his jazzy and funky tunes that are available his on play-along CDs. We thank the Fox Bassoon Company for their wonderful instruments Model 201, 660 and Fox contrabassoon used on this recording and their support over the years. Finally we thank our friends, fans and parents who’ve supported all our bassooning around and encouraged us to make this recording so that others might appreciate what we are doing to promote the world’s greatest musical instrument. The recorded product would not have been possible without the patience, advice and efforts of our recording consultant, engineer and master mentor Kevin Nettleingham. Previously recorded WANTED (Crystal Records CD 873 and Captured Crystal Records CD 875, Crystal Records 28818 NE Hancock Rd. Camas WA 98607 360-834-7022, www.crystalrecords.com. Hells Angels is the first piece recorded for Bassoon Quartet and Orchestra written by Michael Daugherty. The Bassoon Brothers premiere recording of this work can be found on American Contrasts CD with the Oregon Symphony on DELOS records DE3291.